recommended for: Fans of anything by Chuck Palahniuk, John Green, or gently experimental literature. Teenagers. Lost souls. will i read this author again? : Yes. Preferably soon. After falling in love with Reality Boy (and recommending it to a friend for his Family Psychopathology class; he used it and it was great), I was super excited for this BEA souvenir. King more than justified my anticipation. Glory is a strange, touching, strange, gorgeously written, strange book. Did I get that across? I'll summarize: Girls drink a desiccated bat. Girls get ability to see the future. It's a plot that makes me wonder if King hasn't read a lot of Palahniuk, and it works splendidly. From the poem-like titles to the photography metaphors to the snappy dialogue, it's a postmodern wonderland shaped around a romance shaped around a growing up story. It's also, dare I say it, feminist. With sci-fi dystopian goodness. Though Glory's harsh and bitter and not the easiest to like, she's compelling from the first page. Her transformation is much more than learning to see the future. It's realizing that she has one. That she can choose it. That she doesn't have to hide. While gently tugging at the heart strings, it's a book that will make you feel like you can be great. I'm inclined to say that, unilaterally, any book that begins with best friends drinking from a mummified bat corpse is going to be enrapturing. Glory delivers. The plot is multilayered, as complex as life and as comprehensible as breathing. It starts with a misanthrope. Glory's mother killed herself in their oven. Glory has a best friend who may live in a cult, whom she's mean and harsh to, and who sticks around anyway. Then there's the little problem of Glory's visions for a future ruled by a corrupt, women-hating dictator in a dystopian hell. It's motivation enough to get Glory out into the real world, looking for clues. What she finds is a snarky old veteran, a handsome boy who thinks people are pretty great, and an almost-group of what she never thought she'd have: friends. Though the alternating chapters of dystopia are interesting (I mean, Nedrick the Sanctimonious. Are you sold?) they're just the impetus for a more important plot, the process of Glory learning to let people in, to let go of her mother's ghost, and to accept that maybe she can be great. This is a book that could easily be your garden-variety genre sci-fi. King doesn't settle for that. For her, the transmissions of the future are a darkly humorous commentary on society, but more than that, they're a way to push Glory out of her comfort zone. Imagine you're a girl who hates people, who wants to be alone, who tolerates her best friend for unknown reasons. Now imagine that you can read the futures of everyone around you, whether you want to or not. It's that push that forces Glory to care about people, and to learn that it's okay to do so. It's that push that makes this deeper than your standard thrilling sci-fi. A lot of people would probably hate Glory. I did find times when I was angry at her for treating others poorly, but I kind of liked her. I think I empathize with misanthropes and ne'er-do-wells more than most people. I also felt compelled by Glory's existential dread. That she'll turn out like her mother. That her life is circumscribed. She's just damn interesting. All of the characters are. They're a little exaggerated (which works for this story) but they're just magnified versions of real people. Ellie is sweet and immediately likable, but inwardly fragile. Peter is snarky, bantery, and convinced that there's good in the world. Glory's father subsists on only microwave foods because he's afraid to face the past. They're all people could have their own books. This just happens to be about Glory. King has this amazing way of using language in the sharpest, most daring ways. Her writing is saturated with her characters' voices. These words could be no one's but Glory's. It's darkly funny, cynical with a hopeful, profound under layer. Her dialogue is quick and coherent, like an overheard conversation. And she does some cool things, like using her chapter titles to tell her story, like beginning sections with summaries, like playing around with poetry and art. It's MFA writing without being pretentious (not that MFA is inherently pretentious!). There are a couple things about the form of this book that fits the function so well. It reminds me of my creative writing classes. Is your story best told as a movie? A poem? A series of vignettes? Glory's is told as alternating pieces of her life and transmissions from the future (her history of the future, get it?). King carefully juxtaposes transmissions and story to add meaning, to hint, to make you think. It's pretty fabulous. She also uses a ton of photography references. Photography is Glory's passion. She thinks of her moods in zones of darkness, classifying them from blackest to brightest. It's a clever way to show how Glory sees the world without telling you. 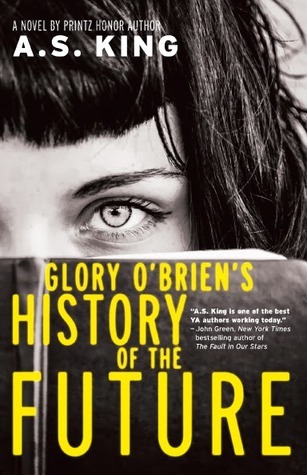 Glory O'Brien's History of the Future takes a bizarre premise and turns it into a deeply thoughtful commentary on society, grieving, and opening yourself up to possibilities. This is such a hard book to tell someone about. You did a good job! I loved it. I've pretty much loved everything King has written. Thanks! It was very difficult to encapsulate it while remaining relatively coherent. I hope I at least captured the spirit of it. 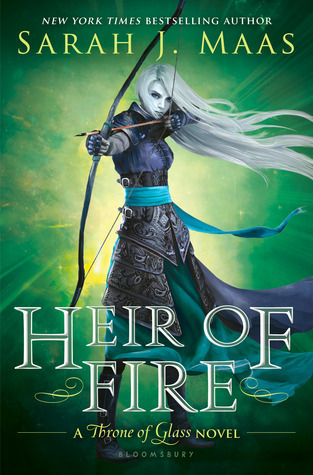 This is only my second King novel, but I'm pretty sure I'll love them all.